SDCC EXCLUSIVES CAVEMAN DINOSAUR & MORE! Two more SDCC exclusives revealed, including the highly anticipated debut from the creator of ROSE VAMPIRE! The first ever painted release of this brand new figure! As any backwoods hillbilly schoolteacher will tell you, humans and dinosaurs existed together in ancient times…but they never existed as one single being until now! The Monster Family extends its arms (and wooden club) to Joshua Herbolsheimer’s CAVEMAN DINOSAUR! A hefty chunk of textured green vinyl forms the base of the CMD, with tan and brown sprays covering his over-the-shoulder loincloth. His spiked head is sprayed with dark green gradations, yellow fangs protrude from a blood-red open mouth, and his eyes are handsomely detailed with white and blue reflections. Start each day with a roar by adding the CAVEMAN DINOSAUR to your toy shelf! This Limited Edition figure stands 4 inches tall and is articulated at the waist – get yours before he goes extinct! Super7’s swamp-mascot pokes his bandaged nose out the water! 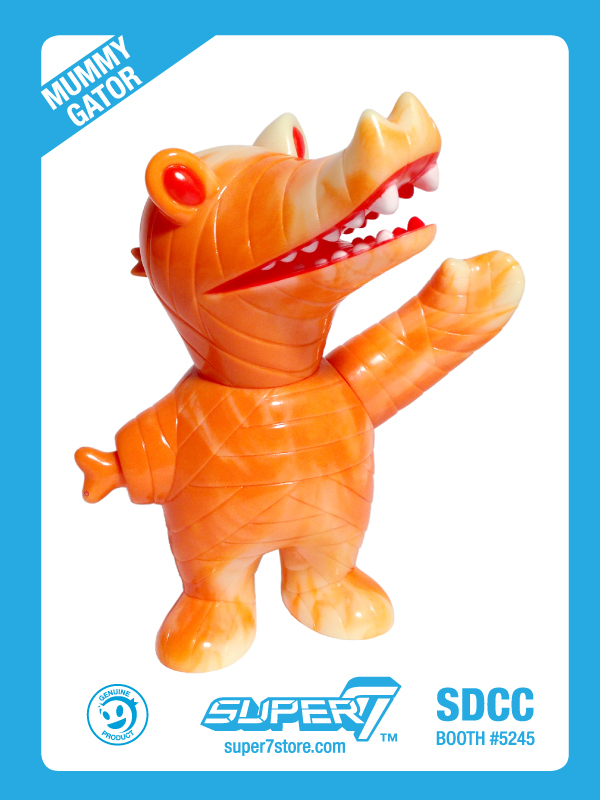 MUMMY GATOR is comprised of orange and Glow in the Dark vinyl swirled together, with white and red facial details. As with every swirled vinyl figure, no two are exactly alike! Standing 6 inches tall and articulated at the neck and remaining arm (with non-articulated bone stump). 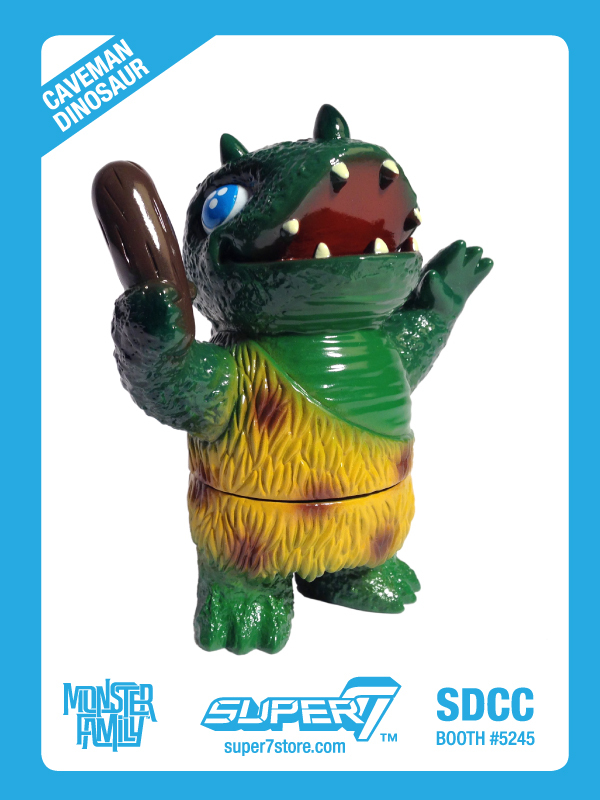 Other Exclusives revealed so far…..
SDCC EXCLUSIVES – THREE MONSTER FAMILY TOYS DEBUT! ALIEN REACTION FIGURE VIDEO REVIEW!